Our 6 Week NVQ Bricklaying Courses are full on hands on nvq bricklaying courses, that are intensive and more rewarding than ever. Goldtrowel has produced an outstanding Bricklaying Qualification package of training and Assessments, in order for you to achieve the City & Guilds 6218 Certificate and the NVQ Level 2, all of which is included in the price of this course. 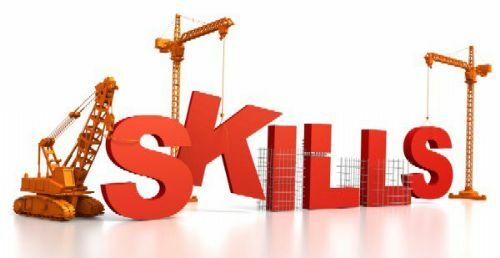 We deliver the NVQL2 Diploma Competence which is a Site based qualification that needs to be assessed Onsite to achieve your Blue Skill worker Card. Which is completed with us. Please read our genuine reviews, students tell you the way it is. To achieve the City and Guilds Bricklaying Certificate you must complete all of the below units. Unit 006 - Introducing levelling in construction - Check the accuracy of levelling equipment and transfer levels using a spirit level and straight edge. Unit 110 - Developing brickwork skills - install ventilation, insulation, wall ties, form stopped ends, lay to building line and joint. Unit 111 - Developing quoin skills - Dry bonding and construction of different styles of brick quoins. Unit 116 - Developing blockwork skills - Construct blockwork, install lintel, wall ties, insulation and form stopped ends and cavity closer including VDPC. Unit 205 - Expanding brickwork skills - Set out, gauge, level and plumb, construct cavity wall and detailing of brick/block walling. This particular bricklaying award is incredibly hands on and will provide you with plenty of Bricklaying knowledge and confidence and will go some way to preparing you for the bricklaying industry. As the City &Guilds Bricklaying Certificate alone is not enough basis for the NVQ process, we provide an additional 2 weeks of Bricklaying training as detailed below. This is the bricklaying award which we will be providing training in and encouraging you to achieve once you are working within the Bricklaying industry. 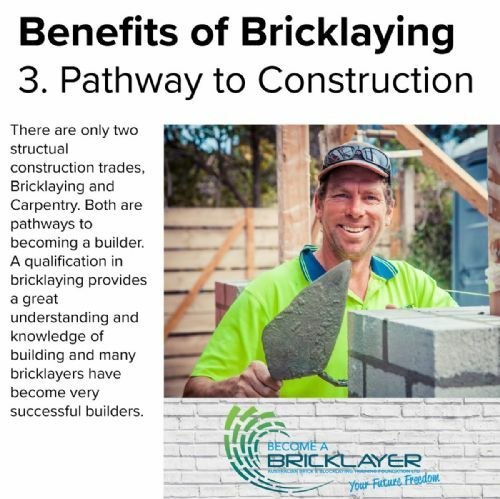 As well as an abundance of practical training in life size areas, we will provide you with a bricklaying laying training manual which forms the basis of your pre course study guide. This Training manual will cover every area required to complete the bricklaying NVQ units and will be something that you can download and refer for years to come. During the entire 6 weeks we will ensure you have a detailed understanding of all of the units which go together to make up a bricklaying NVQ On Site. You will need to ensure that you have evidence of these units within the portfolio you will be building and so training for these will be provided. Training for these units will be completed using practical bricklaying training, theory classes and handouts to assist you in your understanding of what is required of you whilst in the work place. QCF41v2 - Setting out masonry structures in the workplace - This unit is about: - interpreting information - adopting safe and healthy working practices - selecting materials, components and equipment - setting out brickwork and blockwork and/or vernacular style structures on level ground. There is also 1 optional unit to be achieved in order to complete the full Level 2 NVQ Diploma in Trowel Occupations - Bricklaying. We will cover all of these subjects throughout your training time so that you are prepared, once working within the Bricklaying industry, for any eventuality. This structured bricklaying training programme, consisting of 6 full weeks will provide you with a City & Guilds bricklaying Certificate initially (obtained within the first 4 weeks) which will act as your underpinning knowledge and will incorporate many of the areas which make up bricklaying NVQ units so you will be learning all of the time. Once you have completed your 6 weeks of intensive, hands on Bricklaying training, you will then be industry ready which is where you need to be in order to achieve a bricklaying NVQ. To achieve the NVQ you need to be registered with an NVQ Assessment Centre and assessed in the work place, Goldtrowel will register you under our registered Centre as part of this bricklaying training programme. To finish this bricklaying training experience, we will provide you with a portfolio which will include all of the evidence and assessment sheets ready for you to use. We will continually support you throughout the process. We will be looking for you to gain evidence of bricklaying work you are undertaking. Such as : Quotes, Drawings, Estimates, References and letters from customers relating to the work you have undertaken. Quality bricklaying training, good enough and detailed enough to set you up with the bricklaying industry. Register you with the NOCN as someone who is working towards achieving a Bricklaying NVQ.